Tony Guoga was born in Kaunas, Lithuania on December 17, 1973. When he was 11 he moved to Melbourne, Australia. Tony started playing poker games when he was 18, gambling in the Las Vegas casinos with a fake ID. However, he was losing in Las Vegas, so he went over to Europe to play in the cash games their. He improved his poker game, and began earning around $7500 a month playing poker. 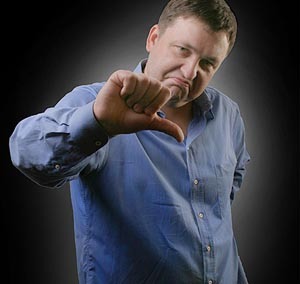 At the table, Tony Guoga is known for his bad and arrogant attitude, and is able to annoy just about anybody at the poker table. Tony Guoga finished 5th in the 2003 World Poker Tour Grand Prix de Paris event. He knocked Howard Lederer out of the poker tournament, and Howard, normally one of the calmest players at the table, refused to shake Tony’s hand because of Tony’s offensive attitude. Tony Guoga made the money twice at the 2004 World Series of Poker and had a second place finish at the 2004 WPT Grand Prix de Paris event, losing to Surinder Sunar. Later that year he would make another WPT final table at the Mirage Poker Showdown. In August 2005, Tony won the $5000 No Limit Holdem Main Event of the European Poker Championships. Tony won the WPT Bad Boys of Poker II event in 2006 when his favorite hand of 10-8 beat Mike Matusow’s K-K. Tony Guoga finished second at the inaugural Intercontinental Poker Championship, where he represented Australia. In November of 2006 Tony won a Betfair Asian Poker Tour held in Singapore, donating half of his winnings to Asian and Australian charities. Tony Guoga has his own poker site at Tonygpoker.com. However, this site is not open to American players. Tony also used to play at Full Tilt Poker under the screenname “Tony G,” but no longer does because it is not a poker site for US players.